The spring thaw swells Castle Creek and the Sacramento River. Few mountains in Northern California have the stark and sudden contrast from its surroundings as the Castle Crags. Erupting from the vast forests of the Sacramento River Canyon, the ramparts and towers of the Castle Crags are spectacular by any metric. Yet, despite their incredible geography and stunning appearance, it is often difficult to find good vistas from which to observe them. Certain points in Castella and few vantages from within Castle Crags State Park offer good places to view the granite splendor. Unfortunately these generally lack a certain elan, since they are basically just large breaks in the forest canopy. Conversely, there are several great places such as the Girard Ridge Lookout and Castle Peak, that permit the dedicated to enjoy staggering views of the Crags but they require hikes or long drives. While they are certainly worth the effort, if time is at a premium then they require more investment than may be realistic. 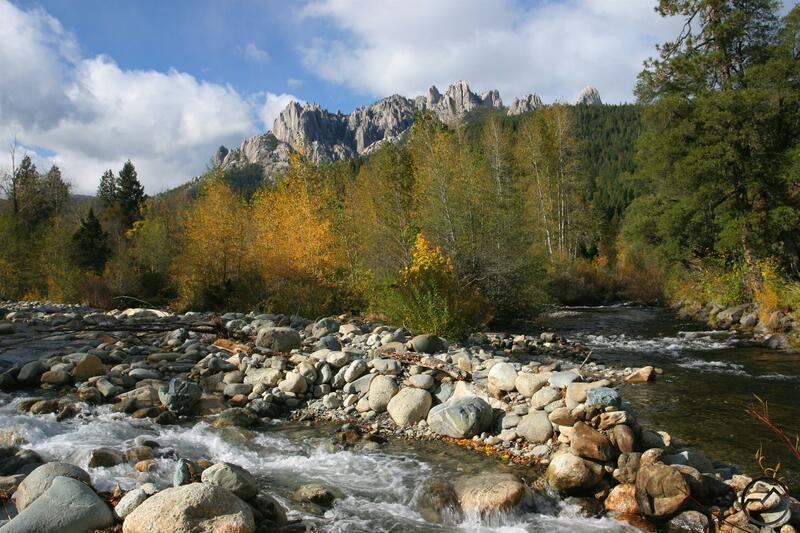 However, there is one spot that is easy to reach that offers a truly spectacular view of the Castle Crags. Within earshot of I-5 and requiring only a short walk on a paved road, the confluence of the Sacramento River and Castle Creek may be the finest view of the Crags’ granite chaos. It is a source of continued amazement that such an incredible perspective on one of the Northern California’s most spectacular formations remains so seldom seen. Although there are several great places to see the Crags, I am convinced that the confluence of Castle Creek and the Sacramento River is the best. At the outset, this view is a variation on the classic aspect most people see from Castella. The great knot of soaring granite towers and massive cliffs are all present including Battle Mountain and Mount Hubris. Six-Toed Rock and Castle Dome are also easy to identify. However, what makes the confluence viewpoint excellent is the presence of so much water, a resource that is often hard to appreciate in the Crags. At the confluence the Sacramento narrows a bit and runs very deep. Small rapids upstream and downstream from the confluence add interest to the location. Castle Creek, on the other hand, runs through a rocky channel with room to spread out and splits into a few different troughs en route to joining California’s longest and largest river. It should be noted that Castle Creek is not an insignificant stream. It is possibly the largest tributary of the Upper Sacramento River. It has a large watershed that includes the Seven Lakes Basin and the hidden lakes tucked away in the mysterious Grey Rocks. The real highlight of these two waterways is where they meet. Castle Creeks is 4 or 5 feet higher than the Sacramento so at the confluence the creek tumbles over a short but broad cascade in order to contribute its waters to the river. Over all of this presides the majestic Castle Crags. Though seldom seen, the view from the confluence of Castle Creek and the Sacramento River is magnificent and not easily forgotten. The confluence does not require a long hike or walk. Due to its ease of access, it works much better as a place to sit, relax and read or to have a picnic or other such time with friends and family. It is also possible to swim in the river here though obviously great care should be taken if doing so. It should be noted that access to this spot passes through a residential area so respect for those who live in the area is due. 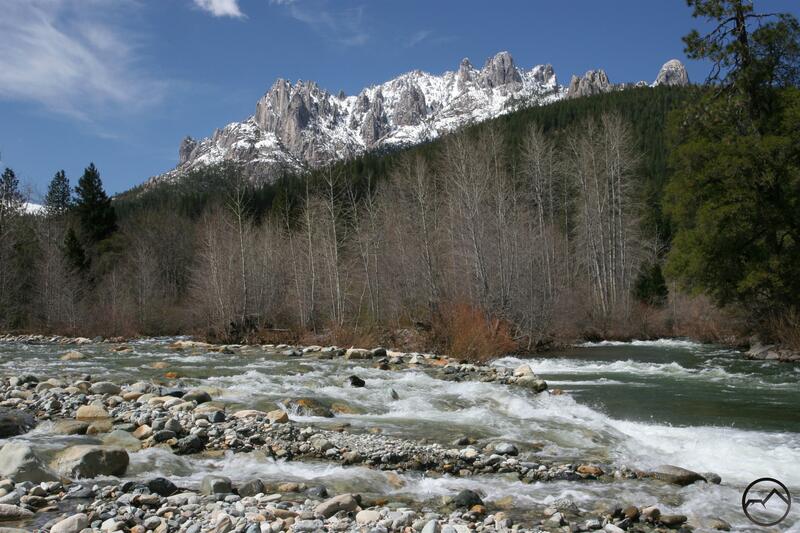 Still, despite the residential setting passed through to get to the confluence, once there the road and homes fade away and all one can see is the glory of granite turrets, rushing rivers, and the great expanse of wonderful river rock. It may be seldom seen but it is stupendous nonetheless. As always, if anyone is curious about details in getting to the confluence, feel free to send me an email and I will give directions. Winter at the confluence. Castle Dome on the far right. The confluence of the Sacramento and Castle Creek. Castle Dome on the far right. Summer at the confluence. Castle Dome on the far right. Can you please give directions to find this wonderful place?? Thank you. Send me an email and I will include directions. Please give me directions to the confluence of the two rivers.